High quality multimeters feature a wide variety of measuring functions and a possibility of TRMS measurements. CAT IV/600 V versions available as well. 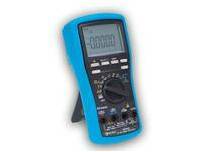 The MD 9060 ranks among the most accurate multimeters with a large bandwidth and very high resolution. Metrel MD 9060 is equipped with a built-in VFD feature that makes the instrument capable of measuring the true values in accordance with frequency, large 2-line 500.000 counts LCD display, fast data acquisition and transfer (via optical interface), CAT IV / 1000 V, TRMS current and voltage measurement, conductance measurement and fast one-handed operation. MD 9060 has a wide range of extra features, including data hold, memory, min / max, average, differential, peak, peak / peak with extra fast 1ms response time, auto power off, frequency filter, reset and relative function. The MD 9060 is the ideal choice for demanding measurement tasks in industry, in the laboratories and in everyday repair and maintenance practice. The MD 9050 ranks among the best multimeters on the market. High resolution and accuracy, 2-line LCD display, fast data acquisition and transfer (via optical interface), CAT IV/1000 V, TRMS current and voltage measurement, non-contact voltage detector, conductance measurement, etc. CAT IV/1000 V overvoltage category and TRMS measurement of AC current and voltage are key features of the MD 9040. That’s why it is particularly suitable for measurements on power supply sources and the most demanding applications in the industrial sector. Its high accuracy, etc. Metrel MD 9035 is a unique automotive MultiMeter top class with many exciting features, such as: Selectable 4-stroke, 4-DIS/2-stroke, & 2-DIS engine RPM; Selectable Trig (+)/Trig- on % & ms readings; Selectable Sensitivity-Levels on RPM, Dwell, % & ms readings, Beep Jack warning, Backlit display and Display hold. MD 9035 is also equipped with automatic range selection and extra fast analog bar-graph. The TRMS digital MultiMeter MD 9030 has been designed for use both in the laboratory and in the harsh industrial maintenance and repair sector. The MD 9020 is a high-quality digital MultiMeter, designed for everyday use in the laboratory and for maintenance and repair in the industrial sector. The digital MultiMeter MD 9016 is a perfect combination of size, Innovative functions and built-in PC communication. It is capable to detect and diagnose most electrical and electro technical problems. Display with large easy-to-read figures and one-handed operation make MD 9016 an extremely easy-to-use. This compact instrument combines a high level of functionality and small size and portability.